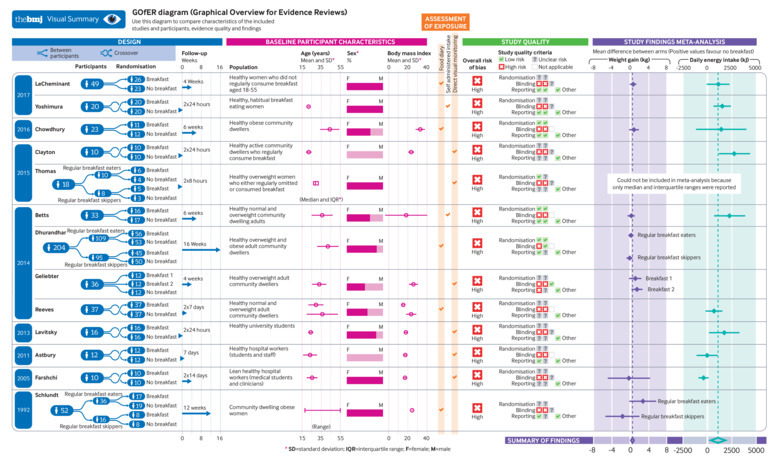 A GOfER diagram (Graphical Overview for Evidence Reviews) showing a visual summary of the included trials from this review. Objective To examine the effect of regular breakfast consumption on weight change and energy intake in people living in high income countries. Data sources PubMed, Ovid Medline, and CINAHL were searched for randomised controlled trials published between January 1990 and January 2018 investigating the effect of breakfast on weight or energy intake. ClinicalTrials.gov and the World Health Organization’s International Clinical Trials Registry Platform search portal were also searched in October 2018 to identify any registered yet unpublished or ongoing trials. Eligibility criteria for selecting studies Randomised controlled trials from high income countries in adults comparing breakfast consumption with no breakfast consumption that included a measure of body weight or energy intake. Two independent reviewers extracted the data and assessed the risk of bias of included studies. Random effects meta-analyses of the effect of breakfast consumption on weight and daily energy intake were performed. Results Of 13 included trials, seven examined the effect of eating breakfast on weight change, and 10 examined the effect on energy intake. 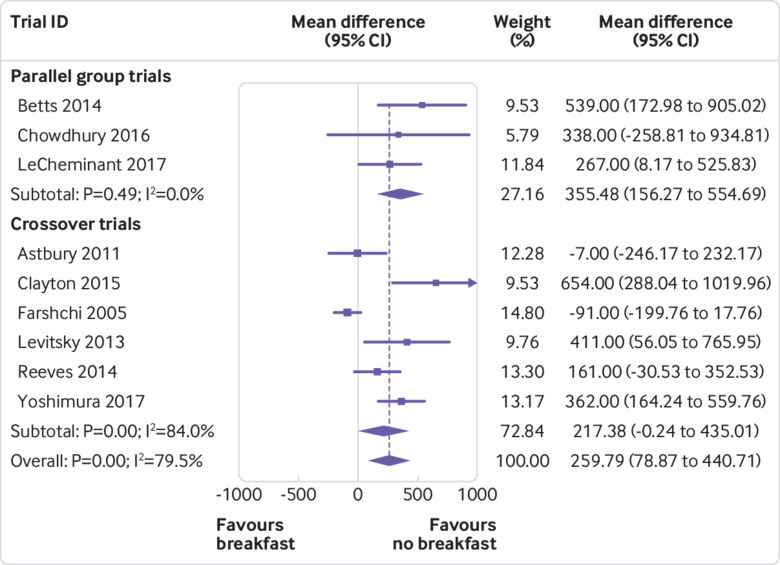 Meta-analysis of the results found a small difference in weight favouring participants who skipped breakfast (mean difference 0.44 kg, 95% confidence interval 0.07 to 0.82), but there was some inconsistency across trial results (I2=43%). Participants assigned to breakfast had a higher total daily energy intake than those assigned to skip breakfast (mean difference 259.79 kcal/day, 78.87 to 440.71; 1 kcal=4.18 kJ), despite substantial inconsistency across trial results (I2=80%). All of the included trials were at high or unclear risk of bias in at least one domain and had only short term follow-ups (mean period seven weeks for weight, two weeks for energy intake). As the quality of the included studies was mostly low, the findings should be interpreted with caution. Conclusion This study suggests that the addition of breakfast might not be a good strategy for weight loss, regardless of established breakfast habit. Caution is needed when recommending breakfast for weight loss in adults, as it could have the opposite effect. Further randomised controlled trials of high quality are needed to examine the role of breakfast eating in the approach to weight management. Study registration PROSPERO registration number CRD42017057687. Obesity is considered to be one of the defining health issues of this time and is recognised as the most prevalent form of malnutrition worldwide, with rapidly increasing rates globally.1 The association of obesity with increased risk of chronic diseases (eg, cardiovascular disease, diabetes, and osteoarthritis) means that it is the major contributor to the global burden of disease.234 In high income countries, weight gain is rising in incidence across all population groups, thus efforts to manage the effects of this problem have been undertaken by government and public health organisations. Thus, the aims of this review were to examine the evidence from randomised controlled clinical trials of the effect of regular breakfast consumption on weight change (weight loss/weight gain), and daily energy intake in people living in high income countries. Our systematic review was reported in accordance with the 2009 PRISMA statement.26 Our review protocol was registered with PROSPERO in February 2017 (registration number CRD42017057687). We included randomised controlled trials in adults that compared breakfast consumption with no breakfast consumption or skipping breakfast and included a measure of either self reported or measured body weight or energy intake. Studies had to have reported at least one of these primary outcomes. Owing to the varying nature of breakfast definitions, only studies that defined breakfast according to content or timing were included. We excluded studies if they compared breakfast content without assessing the role of breakfast on weight management, change in weight, or energy intake. Moreover, studies conducted in children or adolescents, or in populations with comorbidities other than overweight or obesity such as diabetes or binge eating disorder, were also excluded. We set a 28 year search limit because eating patterns more than 30 years ago are likely to have changed considerably from patterns in the past few decades, in accordance with natural changes in population dietary patterns.27 We chose to include studies conducted in high income country settings as defined by the World Bank definition of high income,28 because dietary habits vary immensely across resource limited settings. KS did the search while SMH adjudicated. Two authors (KS and Cate Lombard) independently screened all titles and abstracts and retrieved the full text of any article considered definitely or possibly eligible. Both authors then reviewed the full text articles against the eligibility criteria. Any disagreement between the two authors was resolved by discussion. Results for all outcomes were expressed as mean differences with 95% confidence intervals, calculated from either end of treatment values or change from baseline values. Across the trials, results for weight were always presented in kilograms, whereas results for total daily energy intake were presented as kilocalories per day, kilojoules per day, or megajoules per day. Where required, we converted means and standard deviations for total daily energy intake into kilocalories per day (kcal/day; 1 kcal=4.18 kJ=0.00418 MJ). We included several crossover trials that did not present results of a paired analysis, and that did not report correlations between baseline and end of study data, thereby ignoring within-person variation. We reanalysed the data from these studies assuming different correlation coefficients when estimating the standard error of the mean difference, using formulas provided in the Cochrane Handbook for Systematic Reviews of Interventions.31 We included in meta-analyses the results based on the most conservative approach, assuming a correlation coefficient of 0.3, and conducted sensitivity analyses assuming the following correlation coefficients: 0.5, 0.7, and 0.9. For any multiarm trials identified (eg, comparing breakfast A v breakfast B v no breakfast), we included each pairwise comparison in the meta-analysis (that is, breakfast A v no breakfast, and breakfast B v no breakfast) by dividing the control group sample size in half. The search of the three electronic databases identified 1868 records with 604 articles remaining after the removal of duplicates. Of these, 552 articles were excluded after screening titles and then abstracts, because these studies did not meet selection criteria (eg, did not include breakfast intake as an intervention, did not focus on adult participants, or were reviews or conference papers). 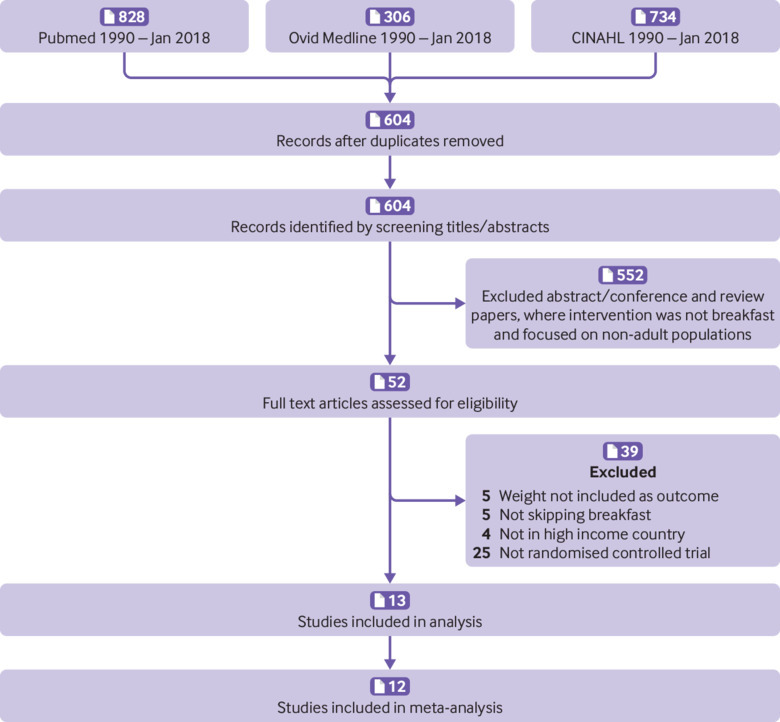 Of the 52 retrieved articles, 39 studies were excluded after full text review because they were not a randomised controlled trial, weight or energy intake was not measured as an outcome, and the intervention was not breakfast consumption. Thus 13 trials were identified as eligible for inclusion in the review (fig 1).23243839404142434445464748 From our searches of trials registers, we identified five ongoing trials that are potentially eligible for inclusion in a future update of our review (register numbers NCT03134014, NCT02093572, NCT03257059, NCT03146442, and NCT03031132). Seven trials examined the relation between breakfast consumption or omission and changes in body weight (n=486), and 10 trials examined the effect of breakfast consumption on 24 hour energy intake (n=930). Full details of the risk of bias assessment for clinical trials are provided in table 3. Among the 13 randomised controlled trials, the main issues were a high risk of bias due to lack of blinding of participants and study personnel and lack of blinding of outcome assessment. Information about random sequence generation and allocation concealment was unclear for most trials. 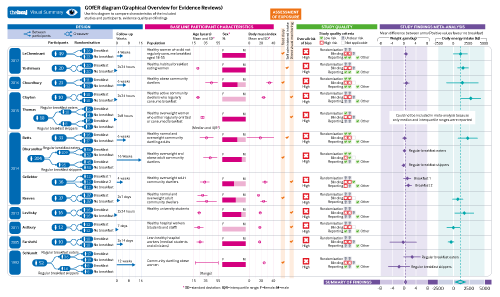 A summary of the proportion of trials that were at low, unclear, and high bias for each domain is shown in figure 2.
Review authors’ judgments about each risk of bias item, presented as percentages across all included studies. Grey area in the blinding of outcome assessment (objective outcomes) indicates that the domain was not applicable because some trials did not measure any eligible objective outcomes. Breakfast eating and weight change (kg) was examined in seven studies.23243941424346 Two studies examined this effect further by separating experimental groups into habitual breakfast eaters or skippers at baseline4146; we included both subgroups in the meta-analysis and observed that the mean differences did not significantly differ statistically and were not noticeably different from results in other trials. A random effects meta-analysis of the results revealed that at the end of the trials (mean follow-up seven weeks, range 2-16), there was a small difference in weight favouring participants who skipped breakfast (mean difference 0.44 kg; 95% confidence interval 0.07 to 0.82; fig 3), although there was some inconsistency across trial results (I2=43%). Based on visual inspection of the forest plot, the heterogeneity of results did not appear to be related to the timing of outcome assessment. 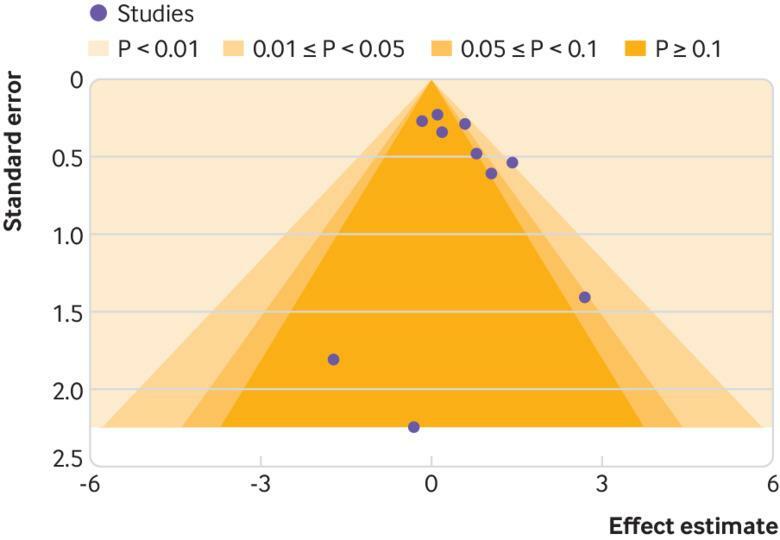 We did not detect any evidence that results of smaller trials were systematically different from those of larger trials (fig 4), and our search of trial registers did not identify any registered yet unpublished trials that are missing from this meta-analysis. Furthermore, we conducted a subgroup analysis based on baseline body mass index and found that the effect of breakfast on weight did not differ between trials including participants with normal weight or overweight243942 (mean difference 0.42 kg, 95% confidence interval −0.01 to 0.85) and trials including participants with overweight or obesity23414346 (0.54 kg, −0.03 to 1.11; supplementary figure 1). Energy intakes were reported according to breakfast consumption in 10 studies.23243839404244454748 In a random effects meta-analysis of nine studies with usable outcome data, we observed that at the end of the trials (mean follow-up two weeks, range 24 hours to six weeks), participants who were assigned to eat breakfast had a higher total daily energy intake than those assigned to skip breakfast (mean difference 259.79 kcal/day; 95% confidence interval 78.87 to 440.71; fig 5). Thus, breakfast skippers did not compensate their energy intake later in the day. However, we did detect substantial inconsistency across trial results (I2=80%). Based on visual inspection of the forest plot, the heterogeneity of results did not appear to be related to the timing of outcome assessment. Of two studies with markedly different results (both found less total energy intake in the breakfast eating group), both were conducted in populations of hospital workers and students.3842 Given that health workers (particularly doctors and medical students) are generally more health conscious,50 this factor could have influenced the inconsistent results. We observed some asymmetry in a contour enhanced funnel plot (fig 6). 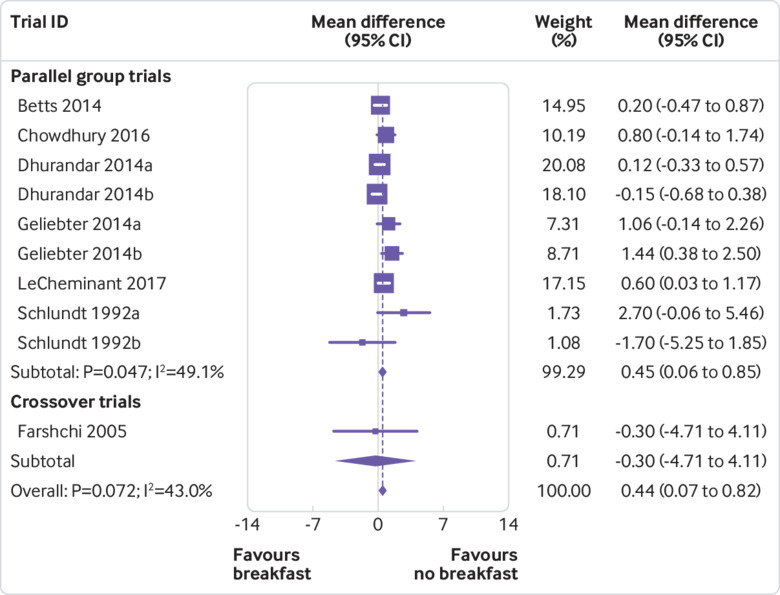 However, reporting biases are unlikely to fully explain this asymmetry, because we suspect that small trials with statistically significant results in favour of eating breakfast would not be disadvantaged in being published given such results are consistent with dietary guidelines. In addition, our search of trials registers did not identify any registered yet unpublished trials that are missing from this meta-analysis. Furthermore, we performed a subgroup analysis excluding the study that recruited only participants with obesity23 and found that it did not have a major impact on the effect of breakfast in regard to total daily energy intake (mean difference 255.89 kcal/day, 95% confidence interval 66.69 to 445.08). To explore whether cultural differences explained our result, we excluded the study conducted in Japan48 and examined studies conducted in the UK and US with regard to the effect of breakfast on calorie intake. We found a minor change in the mean difference (244.61 kcal/day, 49.67 to 439.54). One trial47 could not be included in the meta-analysis of total energy intake because only medians and interquartile ranges were reported; the authors found a higher total energy intake in the breakfast group (median 2516 kcal/day, interquartile range 2363-3324) than in the no breakfast group (2344 kcal/day, 1913-2777) at eight hours’ follow-up. 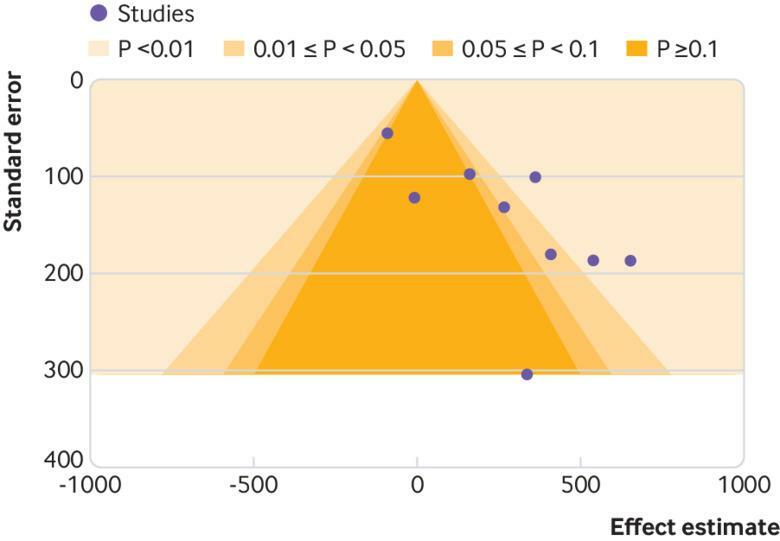 The meta-analysis results for both outcomes were robust in sensitivity analyses assuming different correlation coefficients when estimating the standard error of the mean difference in crossover trials (supplementary table 2). This systematic review of randomised controlled trials examining weight change in adults consuming or skipping breakfast found no evidence to support the notion that breakfast consumption promotes weight loss or that skipping breakfast leads to weight gain. Furthermore, there was evidence to show that breakfast consumption increased total daily energy intake compared with skipping breakfast, with no evidence that skipping breakfast was associated with increased total daily caloric intake. The results were similar when we performed subgroup analyses based on country of origin and baseline body mass index. This review questions the recommendation for breakfast consumption in guidelines aimed at weight loss in adults and has identified a potential concern that the additional calorie intake might actually result in weight gain. 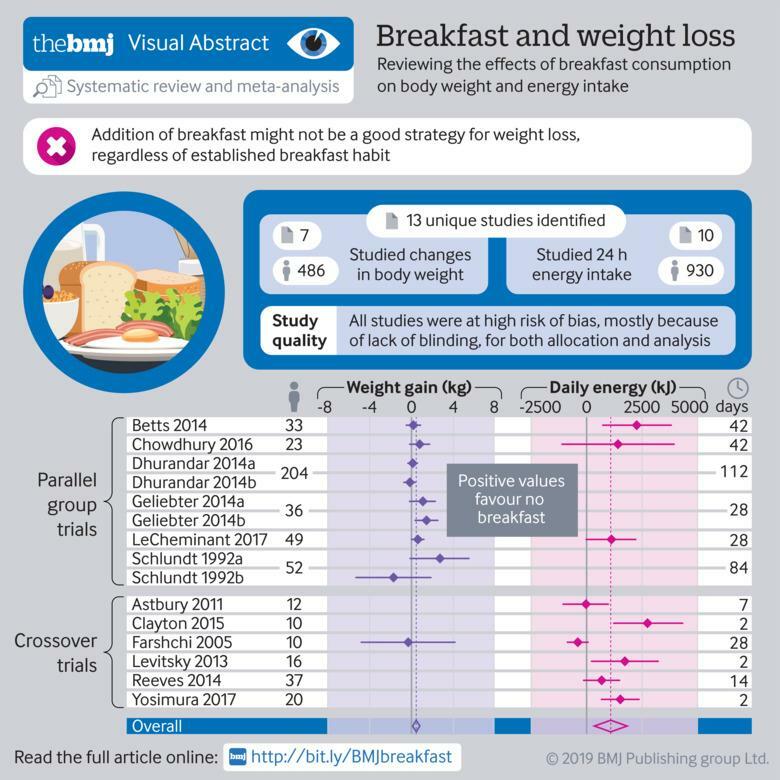 Meta-analysis of the randomised controlled trials did not demonstrate weight loss in participants who consumed breakfast compared with those who did not. Much of the previous support for a positive association between breakfast eating and healthy weight has come from observational studies.205152 However, there are data to suggest that these findings on regular breakfast consumption in observational studies are reflective of a wider healthy lifestyle, in that individuals who are more health conscious and of higher socioeconomic status are more likely to eat breakfast as part of making healthy food choices.5253 This notion is supported in a 2007 cohort study, which noted that participants who consumed breakfast were also more likely to have lower alcohol intake and higher fibre intake.52 Thus, the discordance between findings from the randomised controlled trials and observational studies are likely to reflect residual confounding by socioeconomic factors and healthy lifestyles and highlight the importance of controlled trials to reduce such confounding. Furthermore, a number of the included randomised controlled trials examined a range of hormones involved with appetite regulation and energy balance, including fasting concentrations of leptin,2339 ghrelin,2338394047 glucagon,233839 adiponectin,2339 glucose,2338404247 insulin,2338404247 and HOMA-IR (homeostatic model assessment of insulin resistance).23 In most trials, the levels of leptin,2339 ghrelin,233947 glucagon,233839 adiponectin,2339 glucose,2338394047 insulin,2338394047 and HOMA-IR23 did not differ significantly between the intervention and control groups. Taken together, the data do not support the assumption that omitting breakfast might lead to overconsumption of calories later in the day.55 Instead, they suggest that skipping breakfast might be an effective means to reduce total daily energy intake, and that skipping breakfast does not cause greater appetite in the afternoon. It has been suggested that those who eat breakfast are subsequently more active and therefore have more energy expenditure than those who do not consume breakfast.56 Five of the included studies reported on whether level of physical activity changed after consuming or not consuming breakfast.2324394748 Three studies reported no significant difference in physical activity between breakfast consumers and breakfast non-consumers.232447 Two studies found that breakfast consumption was associated with increased physical activity, particularly during the morning.3948 However, total thermogenesis from daily physical activity was not significantly higher in breakfast consumers than in breakfast non-consumers. We consider the quality of the body of evidence to be low for several reasons. All of the included trials were at high or unclear risk of bias in at least one risk of bias domain and had only short term follow-up; more conclusive results could be drawn with more rigorously conducted trials. We also saw substantial heterogeneity among the trial results for energy intake. This heterogeneity could in part reflect the different populations being examined. For example, the patient populations examined varied from community based populations23394041434546 to hospital workers and students.3842 We focused on high income countries, because dietary habits vary immensely among resource limited settings. However, as obesity is increasingly identified as a public health issue in low and middle income countries,57 it will be important to examine the effect of breakfast consumption in these populations to determine whether it differs in settings where malnutrition might coexist with overnutrition. Most of the trials included in this systematic review were conducted in the UK233839404245 or in the US.244143444647 These populations might differ from those in other high income countries such as Argentina, South Korea, or Saudi Arabia, which do not necessarily follow the same western dietary patterns. However, in this meta-analysis, the types of breakfasts varied across the included studies and tended to focus on healthy options. Thus, although no studies have been performed in other populations, it is likely that if breakfast were to be added to the routine of those individuals who are not habitual breakfast consumers, the results would be similar. This review had several limitations. Firstly, our search strategy could have omitted abstracts that did not state weight or energy intake as an included outcome. This omission could have affected the number of studies included in the analysis, because researchers might have chosen not to report these results owing to the findings being non-significant. Furthermore, the trials included in this review lasted from 24 hours to 16 weeks. Although the difference in calorie intake between breakfast consumers and breakfast skippers was about 260 kcal/day, which could lead to increases in body weight over time, these timeframes make it difficult to draw conclusions about energy intake and change in weight. Longer duration studies are needed to investigate the long term effect of adding or omitting breakfast. In addition, we had to impute missing standard errors of the mean difference for all crossover trials, because paired analyses were not available in any of the included papers. However, results were robust in sensitivity analyses imputing different standard errors. As the quality of the included studies was mostly low, the findings should be interpreted with caution. Currently, the available evidence does not support modification of diets in adults to include the consumption of breakfast as a good strategy to lose weight. We also found that overall, modifying diets to include breakfast consumption was associated with an increase in total daily calories. While breakfast has been advocated as the most important meal of the day in the media since 1917,5558 there is a paucity of evidence to support breakfast consumption as a strategy to achieve weight loss, including in adults with overweight or obesity. Although eating breakfast regularly could have other important effects, such as improved concentration and attentiveness levels in childhood,5960 caution is needed when recommending breakfast for weight loss in adults, as it could have the opposite effect. Further high quality randomised controlled trials are needed to substantiate whether those individuals seeking to lose weight should skip or consume breakfast and the role of breakfast eating in an overall weight management approach. We thank our colleague, the late Cate Lombard (Monash Centre for Health Research and Implementation; Monash University Department of Nutrition and Dietetics), who provided her insights and expertise to this manuscript, which greatly assisted the research. Personal disclosures: KS and FMC do not consume breakfast; HJH eats breakfast occasionally; and SMH, MJP, YW, and MM eat breakfast daily. Contributors: KS and SMH share joint first authorship. FMC and CL were involved in designing the study. KS and SMH were involved in searching the database. KS and CL screened citations for inclusion. KS, MJP, and MM were involved in risk of bias analysis. KS, YW, and HJH were involved in extracting data and interpretation. MJP analysed the data. KS, FC, MJP and SMH drafted the manuscript. FMC is study guarantor. All authors reviewed the final manuscript and agreed to be accountable for all aspects of the work and approved the final manuscript for submission. The corresponding author attests that all listed authors meet authorship criteria and that no others meeting the criteria have been omitted. Funding: This study did not receive any specific funding. SMH is supported by an early career fellowship from the National Health and Medical Research Council (NHMRC; No 1142198); YW is the recipient of NHMRC career development fellowships (clinical level 1, No 1065464); MJP is a recipient of an NHMRC early career fellowship (No 1088535). Data sharing: The data and statistical analysis code for this paper are available on the Open Science Framework: https://osf.io/sqgn9/. FMC affirms that the manuscript is an honest, accurate, and transparent account of the study being reported; that no important aspects of the study have been omitted; and that any discrepancies from the study as planned (and, if relevant, registered) have been explained.
. National, regional, and global trends in body-mass index since 1980: systematic analysis of health examination surveys and epidemiological studies with 960 country-years and 9.1 million participants. Lancet377:557-567.
. Country classification - World Bank country and lending groups.Vol 2018. World Bank, 2018. StataCorp. Stata statistical software. Release 14. 2015.
. Good Health. Good Health Publishing Company, 1917:52;389.